As we race into the future of space travel, electric cars, and high impact sports, some of our biggest challenges are not actually how we design our future modes of transportation but what we actually build them with. 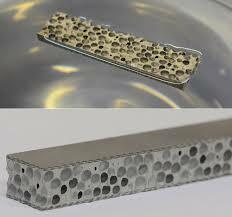 It’s a brave new world, and with a new world, we need new materials. Unlike its soft padded equivalent, the syntactic foam may be the material key to protecting ourselves in the future. Foam is practically defined a mass of bubbles that are held together by some materials. There are certain advantages of making super strong foam. It is very lightweight and can hold a significant amount of load at a time. It also has an advantageous weight to loading ratio. The materials used in the foams are intended for use in transportation application that can reduce weight and increase the safety of the passengers. It is considered as the strongest foam in the world and is known as syntactic foam. For getting the porosity, the tiny materials were filled with the particles. It will come out as a porous material just like the kitchen sponge. It does not have any strength and can absorb lots of water. It also looks like the surface of the moon to give an analogy to the viewers. In cars, one of the reasons you want to use foams is in the case of accidents. They absorb a lot of energy and save the passengers inside. But when you reduce the weight, you increase the fuel efficiency on top of every other technology. This is the greatest advantage of the lightweight material.